This past weekend, the JFRC facilitated a class-wide trip to Umbria, the literal heart of Italy. Situated just west of Rome, Umbria is by far one of the most rustic and authentic Italian places I have been. I’ll give a basic rundown of the trip because quite honestly, my words cannot describe the antiquity and beauty of it all. First stop was a ceramic shop in Deruta. Sounds simple (and kind of odd) enough. But if you are like me and most of my other classmates, you would instantly recognize the beautiful and hand-painted designs that adorn all sorts of plates, vases, tables, candelabras and more. Keep in mind that Saks and Nordstroms buy these goods and sell them for primo $$$. After the shop we made our way over to lunch which was simply delicious. A five course meal, served under a replication of a renaissance mansion, on a beautiful and luxurious estate. Very full and happily buzzed from the delicious wine served with lunch, our next destination was Perugia. 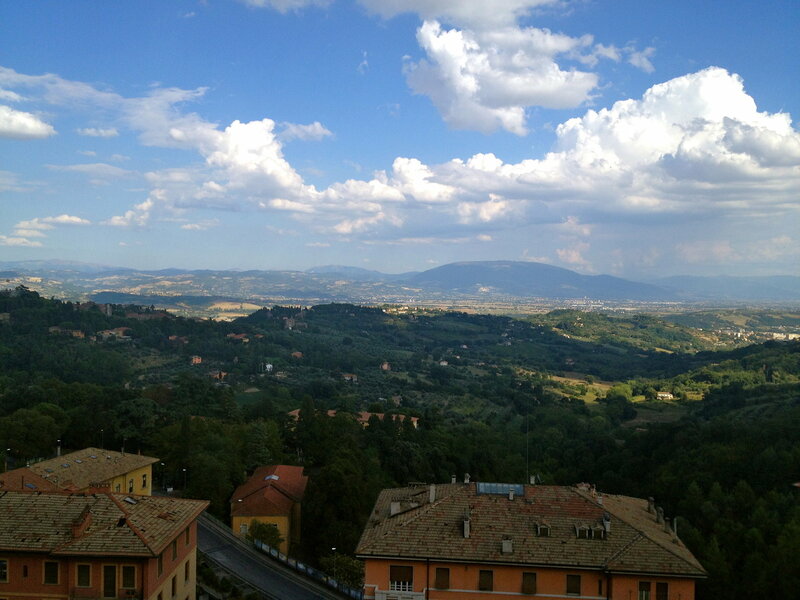 Perugia is most famous for their chocolates (which are divine), but what I didn’t know until we got there was how breathtaking the landscape was. Situated on rolling and very steep hills, the city offers views of Umbria that Bob Ross could only dream of painting. 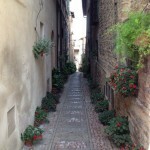 We didn’t have very much time to in Perugia but it’s definitely worth a trip out to Umbria, should you be interested. After Perugia we made it to our final destination (for the day), to our hotel in Spoleto. After a glass of wine in a local but very friendly bar, I fell into a deep and lovely air-conditioned sleep. We started the day off with a tour of Spoleto. The hilly but picturesque walk was led by a lovely Umbrian woman who told us all about the rich history of the small town. She took us through some of the most beautiful areas, including crossing a bridge that would scare the hell out of anyone afraid of heights. The walking tour was followed by a lovely lunch at Spirito Divino, a beautiful countryside hotel/restaurant, where we ate giant pizzas and drank delicious wine. The day was concluded with another walking tour in the town of Bevagna, most famous for their medieval preservations and shoppes. Not only was the town relatively flat (a major relief after having climbed around Spoleto and Perugia), it was charming and pretty educational. The final day was focused around the town of Spello. Another guided walking tour led us through the steepest but (arguably) the most quintessential Italian citta. Prosperous in the Medieval era, Spello was also home to many gorgeous and very old churches, apartment buildings, gardens, and watch towers. 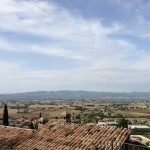 The trip was concluded with an intimate and low-key lunch in a olive grove, surrounded by the rolling hills of Umbria, olives you could pluck off the branch and pop in, and good people. All in all, Umbria is a must if you are looking for the classic and non-touristy side of Italy. It’s funny, because during the weekdays, I am ITCHING to get to the weekends so I can do all the fun things I have planned! Friday I went with some of the USAC students on an early morning voyage to a national park about 2 hours away from Madrid to KAYAK! We kayaked along the Duraton River with a tour guide and were on the lake for about 3 hours. We learned about vultures that reside in the park and saw ruins of some ancient monasteries and villages that were built in the 1300s, as well as the home of Saint Fructus and a sight where he created a miracle which made him a saint. After a hike up a huge, sandy hill and some after-effect achy arms from paddling, our group went to a restaurant for some paella! Paella is a rice dish served with chicken and seafood and vegetables and is famous for its Spanish roots. It is a very savory dish, but not knowing what kind of meat and mixing types of meat has not been too appealing for me. 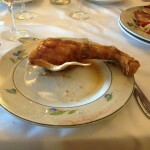 Plus there are shells and eyes to keep watch for in each forkful… (see below). Saturday I went shopping with my friends down Goya Street and in Puerta del Sol and I got a necklace at a really cool store called Sfera. In the evening, a couple friends and I went to a famous chain of restaurants in Spain called El Tigre which are known for mojitos THE SIZE OF YOUR HEAD. I couldn’t finish all of my drink, even though it was delicious. Along with the mojito you are served tapas, typically potatoes with a creamy sauce over it called patatas bravas (Have I mentioned they love carbs here?). It was the most crowded bar I have been to so far, but I am sensing many more nights at El Tigre because of the fun we had. Sunday I went to a bullfight with some friends, which is one of Madrid’s biggest claims to fame and a deeply rooted tradition in Spain. It is a once in a lifetime event for me, as I do not plan to go back… But the architecture of the stadium is beautiful (of course), and I guess more than anything this experience made me more “culturally aware.” The matadors were very graceful and colorful, and are considered huge celebrities in Spain, similar to our celebrity athletes. -Seafood is usually served with the full body intact…eyes and everything. I learned this the hard way after my first bite of paella when I discovered a full prawn had unknowingly been under the rice. -Most are not overweight. My friends and I decided that even though they eat only carbohydrates and seafood, they sit and enjoy their meal, and aren’t rushing around. -I’ve probably mentioned this before, but I take the metro to and from school and it is KILLING me that it isn’t customary to bring coffee in travel mugs. 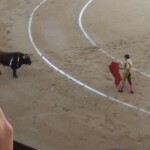 -I don’t like bullfighting. That was definitely a once in a lifetime deal. Over the past few weeks I have ventured out to explore more of Beijing. Most of the time people in our group end up going to Sanlitun, the embassy district where there are many international stores and international people. Almost every time I am out I meet someone from a new country ranging from Russia, the Congo, Germany and Pakistan. On average every expat or international traveler I meet speaks 3 languages and has lived in at least 2 different countries excluding their home country. There are some people who go on dates of business meetings and everyone speaks different languages and Chinese is their common ground. It’s so fascinating to realize how international Beijing is. Even though about 1% of Beijing’s population are international compared to 20% in New York, the community that is present among expats appears much stronger. There are not separate areas for each ethnicity, but rather just common gathering areas for all nationalities. I’m picking up bits and pieces of new languages while studying intensive Chinese. Everyone is very willing to help and have amazing connections within China and around the world from being so well traveled. I never thought about living internationally until studying abroad in China. Living as an expat can be extremely challenging, but also very rewarding. The people you meet and the community and support you develop between one another is unlike any relationships I have back in the United States. 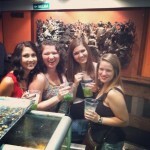 In the past two weeks I have become more acclimated to Spain through food, travel, and some great friends. 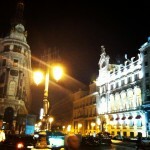 My first “night out” was Madrid’s Fashions Night Out. This event is a global fashion party in short. It takes place in major cities around the world including my very own Chicago. As an avid, self-proclaimed, lover of shoes, defender of bags fashionista, of course I jumped at the chance to be a part of Madrid’s Fashions Night Out. Dressed up with my make-up done, hair straightened, and some of my favorite pieces of jewlery I wandered my way around Madrid’s high end shopping district. Every store was lit up like Christmas. Some of the most elegant women and classiest men were in attendance. Fashion designers, boutique owners, and Madrid’s socialites made their way around the numerous parties. Drinks and hors d’oeuvres were passed like their was no tomorrow and I was a part of it all. I purchased a pair of black earrings while enjoying a mojito at a store called Rimini. I then made my way to a men’s tuxedo and fine apparel store where I enjoyed my own personal mini champagne bottle. By the end of the night I was enjoying what I do best-people watching. As I sat on a bench, I realized that I have a pretty awesome thing going here in Spain. At 1 AM when parties were still in full swing I headed home thinking of all the beautiful people and things I saw. Spain came from the Arabs but was built from Roman foundations. 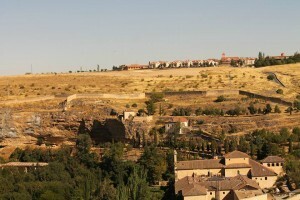 1120, around 32 years after the city of Segovia returned to Christian hands, during the time when Alfonso VI of León and Catile reconquered lands to the south of the Duero River down to Toledo and beyond, was the first time we see this fort referenced in history. 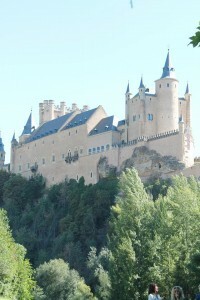 Alfonso the VIII and his wife made this Alcázar their home during which time most of the work was done to create the stone fortress that exists today. The inside of the castle is breathtaking with picturesque views of the country side and amazingly detailed ceilings and art work. The last stop of the castle was the trek up the 152 stairs of the tallest tower in Alcázar to the top of the castle; my favorite part of the visit. After the visit to Alcázar we had free time in the town and I chose to visit the cathedral-Catedral de Nuestra Señora de la Asunción y de San Frutos. This cathedral was breathtaking, not only from the architecture on the outside but inside as well. 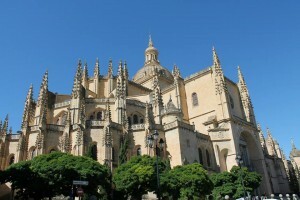 The cathedral was built between 1525-1577 in a late Gothic style. The inside is comprised of numerous chapels, meeting rooms, a courtyard, and one of the most beautiful organs I have every seen. The bell tower reaches 90 meters or about 295 feet! cutting the cochinillo is actually quite funny because to finish the process you throw the plate on the ground when you are done! My piece included one of the pig hoofs and the tail! Watch the video below to see how it is cut! Stay tuned to see where else this semester takes me! So… I know I’ve been a particularly bad blogger considering we are already into week 4 and I haven’t even tried to tell you all of the wonderful things I have been up to in Rome! That’s the thing though, there is so much to do in Rome and between classes and exploring, there has barely been a minute to catch my breath, so forgive me. Classes started on the 2nd of september and so far they are great. I am taking Writing in Rome, Church in the World, Italian 101, and Intro to Opera. I am beyond impressed with the professors here, they are incredibly talented and intelligent people. My writing class is easily my favorite as it is onsite. We generally read short stories set in Rome before class and then spend class visiting the sites mentioned in the stories. It’s pretty awesome to be in the same locations these writers were inspired by. This weekendend I am heading out to Naples for a day trip, and then moving onto the Amalfi coast before it gets too cold! I will write again once I get back from the weekend! “Anfractuous” : characterized by windings and turnings; sinuous; circuitous. Our first weekend in Rome was well spent getting to know fellow JFRC-ers and employes of JFORCE on our orientation trip in Umbria, Italy. We traveled through the most “anfractuous” roads you could imagine. 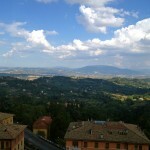 One of my favorite stops (as pictured above in the panorama) was at Perugia. Interesting enough, Perugia is the city in which the Amanda Knox case took place, giving us a plethora of conversation during our lengthy trolley ride up the side of the mountain. It was interesting to hear the different sides of the case coming from those who had heard about it in the U.S. and those who had heard about it in Europe. One of my favorite staff members here, Dr. Susanna Cavallo, has followed the case from the beginning and believed whole-heartedly in the innocence of Amanda Knox. Others disagreed and debates ensued. Along the trip we visited ceramic factories, ancient cities, candlestick makers, ancient money-smiths and silk weavers amongst other awe-inspiring places. But in general, my favorite part about the trip thus far, and I believe I speak for my friends here as well when I say this, was meeting the notorious Professor Alexander (Sander) Evers. I feel as if we are in a movie right now while writing this blog and this is where the music dramatically climaxes and now it’s time for a simple sentence why Evers is such a phenomenal person to be around should be written whilst loud music with drums in the background go crazy, but instead I will tell you the story of my first encounter with him and hopefully that will give you a good idea. We were all exhausted after having spent the good part of 2 hours in an un-air-conditioned ceramics shop and then a lengthy bus ride towards our destination: food. As our 4 packed buses of students pulled up to a peaceful villa I knew the day’s adventures had only just begun. We all sat down, having a nice relaxing meal with nice relaxing wine and nice relaxing small talk, wanting to just revel in the coolness of the place and the hospitality we were being shown. As we made our ways slowly out to the garden area I heard the loud booms of a voice that everyone (even within only a week) had begun to recognize. There was Evers, making his way onto the patio to join the students. Chandni, one of the SLAs on the trip, gathered my friends and I around Evers and asked for a picture to be taken. As a normal group of human beings, we took a normal picture together, see? And then the chaos began. Evers looked at us and with that devilish gleam in his eye he said, “Let’s get one with you all holding me up.” Of course, as I am sure anyone meeting this man will come to find out, it is hard to say no to him. So we proceeded to pick him up for a picture, me and three of my male friends. Chandni then played the devil’s advocate and gave use the bright idea to throw Evers in the pool in the middle of the garden. As we made our way towards his waterlogged doom he was shrieking in his not-so-masculine-anymore voice that it was time for us to put him down. This egged us on further until we got to the very side of the pool and ALAS! we did not in fact throw him in. Pleas from him and now Chandni prompted us to put him down as gently as possible, although that failed to work as well as we thought it could. As gravity pulled half of his body back to earth, the other half proceeded to pull my sunglasses from around my neck and what happened next was a perfect snapshot in my mind. Picture this: a rather tall Danish man (correct me if I’m wrong) tilting to one side with every chance of entering into the pool now on his own accord, yelling in words we cannot understand, one leg in the air and both arms flailing trying to balance his weight, crashing down with one large foot directly onto the fallen sunglasses that anyone else would have been able to miss. Everyone was in shock, yet no one could stop laughing. With tears of laughter streaming down my face, I looked at Evers and I spoke my first words to him; “How does that happen? There were so many other places to put your foot, how does that happen?” He proceeded to apologize profusely but I could not even be mad at the hilarious spectacle I just witnessed. Suffice to say, it was a great introduction. I now have him in a history class and I sit in the front row every day. If you get a chance to come to Rome I suggest (so far) that you make sure to meet two specific people – Susanna and Evers. Bonjour tout le monde et je suis desolée pour le retard! Je m’appelle Marli, comme Bob (as the French tell me). I am a rising junior at Loyola University Chicago studying anthropology with a minor in French studies. Who could possibly know what I’ll be able to do with that; but c’est la vie, vrai? Now, I am studying at Université de Pau et des Pays de L’adour (Université de Pau for short) as an international student (étudiants étrangers). This will be my second week here in the lovely, small city of Pau, France! To be honest, a lot of people don’t really know Pau exists. I live in the Aquitaine Region of southwest France, in what the French call: le département de Les Pyrenées Atlantiques (the Pyrenees). This petite ville (small city) is not well known to be full of tourist attractions but offers an array of beautiful scenery and a few famous castles. I recently visited le Chateau de Henri IV le week-end dernier (last week-end) and found myself absolutely speechless. This enormous castle stood against this beautiful backdrop of the Pyrenees like something out of a fairytale or Disney logo. From perfectly manicured bushes and landscapes, everything looked immaculate! As far as language barriers go, I have had my share of unfriendly remarks and snickers because of my inability to speak French. I have also had university students call me “mignon” which means “cute” because they find my franglish endearing. I have to say that it is a bit difficult to try and salvage what little French phrases that I know because most French people aren’t very patient. For example, when I am checking out at the grocery store I usually greet le caissier with a “Bonjour” or “Bonsoir” depending on the time of day. Side note: It is not very acceptable to say ‘bonjour’ any time after 7 p.m. (even if it’s the only word you can think of at the time)! As I put my groceries into my bag, le caissier tells me the price of all my items. In my haste, I rambled in English and I repeated the total back to her, in French, to make sure I heard correctly. Apparently, you don’t do that. While I was reaching into my purse to look for my euros, le caissier immediately writes the total down on a piece of paper (like I didn’t see it on the register) so I’d have both a verbal and visual understanding. Her expression was bothered and she rudely gave me my change. I could feel that she didn’t want to be pestered with my less than accurate French speaking or my incoherence and “inability” to read a register screen. But this was only one encounter. Discouraged, I hadn’t tried to speak French while I went to the grocery store or to the small university mall. One day, two native French students told me to only speak to them in French whether I thought I would be wrong or right in my responses. So, I did. And guess what? I was told that I was not as bad as I made it seem. I was told that French people are no more confident with their English than foreigners are with their French. I made the mistake by inadvertently forcing le caissier to understand my comfort language of english rather than forcing myself to step out of my comfort zone and speak in hers. Since then, I have had nothing but pleasant experiences while shopping and going around about the ville. I have noticed that people are more amiable and helpful when I speak a little French than when I ask for help in English. 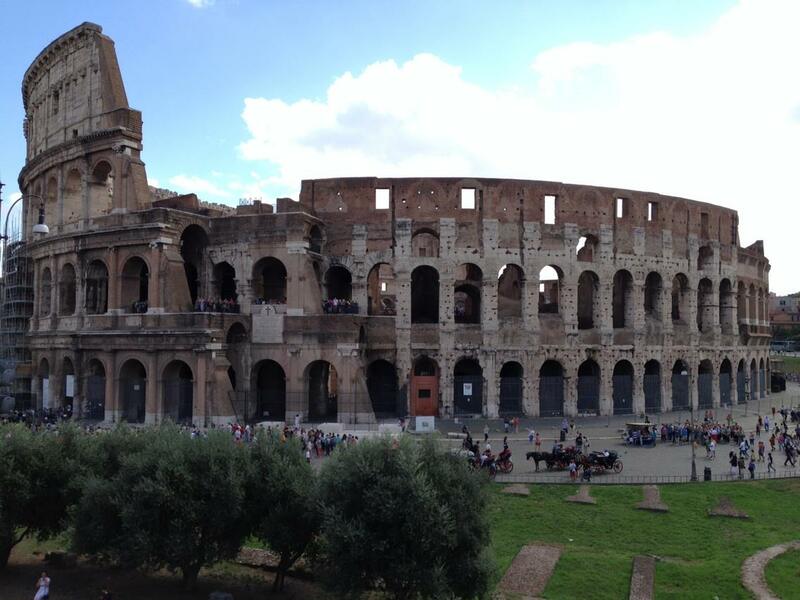 I apologize for not updating the blog sooner, but it’s been difficult due to my travels in and around Rome. In the past week I’ve visited the neighboring region of Umbria twice and have had the opportunity to explore the city of Rome as extensively as I want. The weekend of the 6th served as the first study trip for the Rome Center. The school made all the preparations for us, including transportation, hotel, and, for the most part, our meals. 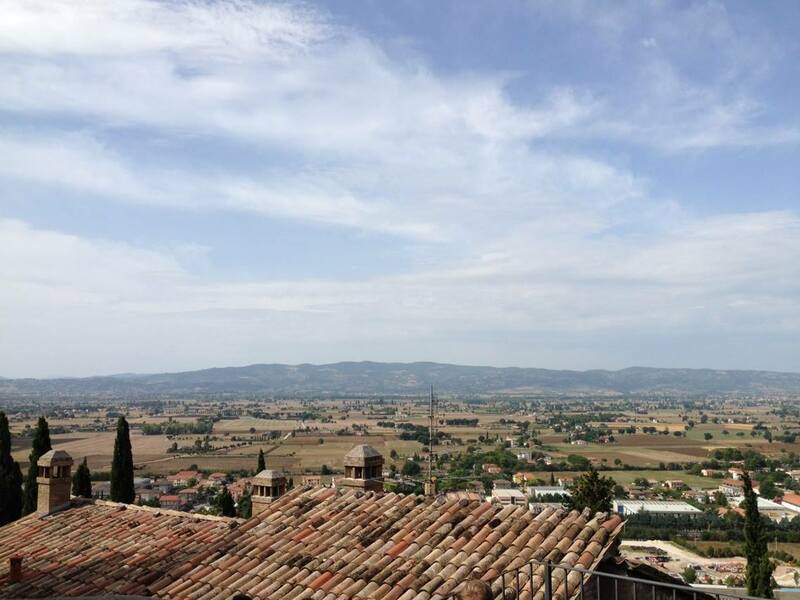 We traveled to Rome’s neighboring region (akin to states in the United States), Umbria. The trip was three full days, from Friday to Sunday. 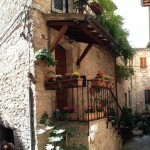 We stayed in the town of Spoleto and we visited the towns of Spello, Perugia, and Bevagna. Spoleto was our home base and our hotel was located there. It’s a small town in comparison to Rome, as were all the towns we visited, but there was still a lot to see. 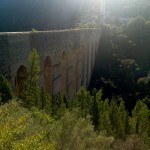 Perhaps my favorite part of Spoleto was the giant bridge, named Ponte delle Torri, that also doubled as an aqueduct. The bridge itself was 400 feet tall and almost that long. Seeing that bridge, which was about 800 years old, really brought history to life. I tried to imagine how it was built, and in doing so I appreciated the technology we have today. We also toured the nearby towns of Spello and and Bevagna. Both of these towns each had their own unique characteristics. Bevanga had a number of artisan shops that we were able to tour. These included a medieval candle maker, a medieval/Renaissance silk maker, a medieval paper maker, and an ancient Roman coin mint. The town itself was nice, with narrow streets, little traffic, and a number of small shops that were off the beaten path. 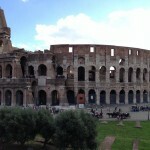 It was fun and, being close to Rome, it will be easy to go back if I choose to. 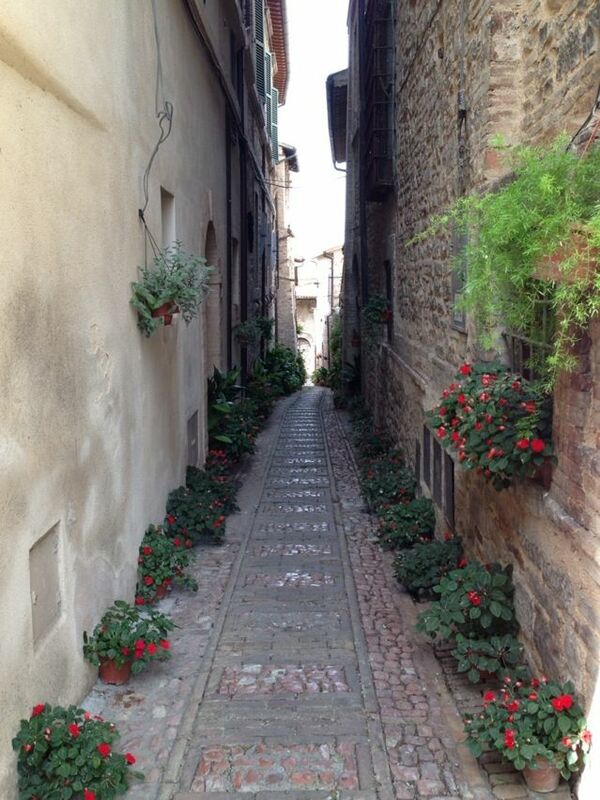 Spello was also a great town to tour. It was much hillier than Bevagna or Spoleto and it has a unique (and awesome) ‘flower culture,’ in which residents compete to have the nicest flowers outside their homes (see the photos). Such flowers led to some great scenes. The town itself is also situated on a hill and offers some amazing views if you feel like hiking a bit. The vistas I saw there rival views seen in the United States. Overall, the weekend trip to Umbria was a great experience. 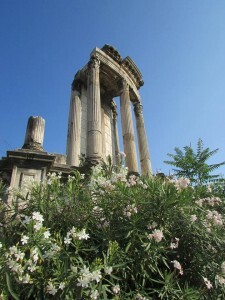 It was a good primer on traveling and it offered us more to see than the “generic” sights of Rome. If we weren’t immersed in Italian culture yet, we surely were by the end of the trip. Now that classes have started and I have settled into a more solid routine, I have had the opportunity to explore Rome, mostly on my own. My class schedule allows me, on most days, to leave campus and explore the city for most of the day and return in time for class. 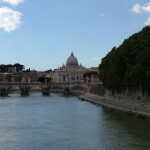 I certainly took advantage of that this past week when I explored Rome off the beaten path. To detail all of my city travels would be cumbersome, so I’ll stick to my favorite parts. Last Wednesday, when I didn’t have class all day, I wandered down to Piazza Navona, which is about an hour from campus by bus and walking (it’s not far across the river from the Vatican for those who are familiar with the area). From the Piazza I walked down side streets looking for a 400 year old library I had researched. I eventually found the library and of course entered it. It was completely free of tourists and I could take my time looking around. See the photos below for more detail on the library. A panoramic view of the library. 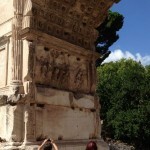 On Thursday I had my first on-site Art in Rome class, which was at the ancient Roman Forum. There was a slight admission fee but it paid off. Our teacher, John Nicholson, has been teaching the class for several decades and knows all there is to know about the Forum (and in fact anywhere in Rome). It was amazing to be at the Forum for a class on the Forum. Instruction certainly occurred regarding certain architectural features that have survived the centuries, but it was also a history lesson. It’s difficult to describe the difference between a history lesson far removed from the site of an event’s occurrence and an on-site lesson. All I can say is that being on-site makes all the difference. It’s almost worth studying abroad just for that, if you’re as big a history nerd as I am, but studying abroad is good for other reasons as well. 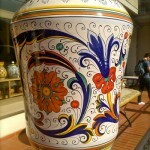 Taken during on-site Art in Rome. The Coliseum- taken during Art in Rome. 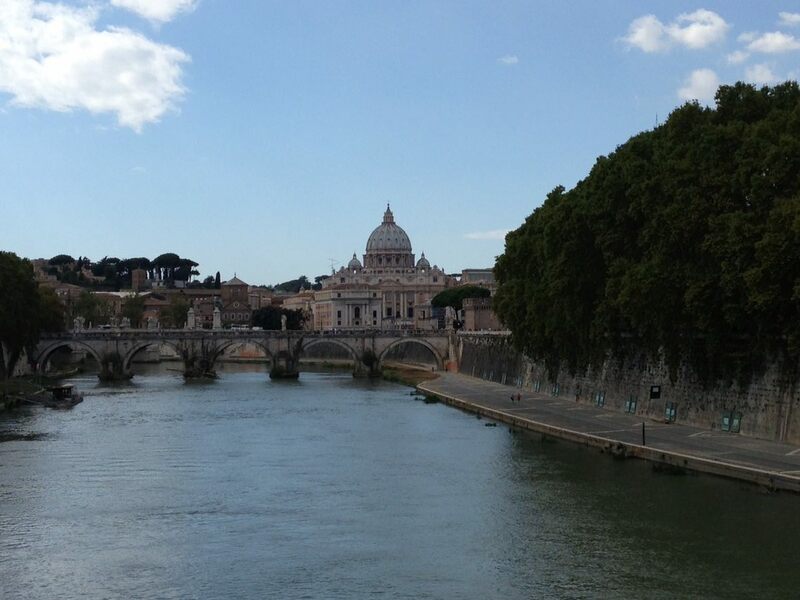 Just one of many great views of the Vatican in Rome. Finally, on Friday (which is always an off day for traveling) I went back down to Piazza Navona, explored in more detail the area around the Pantheon, and ate dinner at a Chinese restaurant in a small piazza called Piazza dell’Oratorio. The night was made when I heard the lofty sounds of a violin echoing through the streets as I ate. So far it’s been a good time in and around Rome. My next goal for exploring is to visit farther regions and cities like Tuscany, Florence, and Naples. Beyond that I plan on visiting other countries in Europe- after all, that’s what study abroad is for, right? 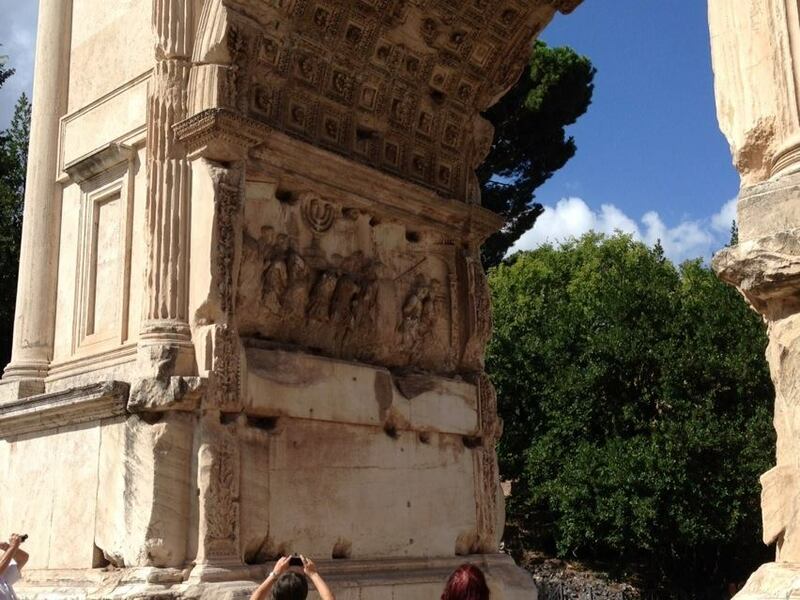 Here’s a short post on one of the most amazing things that have happened to me in Rome. Long live the Italian people!! Yesterday was my first full Sunday in Rome since the semester started, so I thought it would be great to go to the Pope’s Angelus prayer at noon to get into the Roman/Vatican spirit. I got to Saint Peter’s Square at 10:30 a.m. so as to get a “nice view” of the window the Pope uses to give his speech. As we are technically still in summer and the weather had been nice last week, I was totally unprepared for three hours of pouring rain. No umbrella, no jacket, no raincoat or anything to protect me from the water and wind, I was just standing stoically in the middle of the piazza, wet as if just out of the shower, water dripping everywhere from eyebrows to my shirt. No money in my pockets, I couldn’t even buy one of the dozens of umbrellas and raincoats that street vendors offered me. To say that I was just “wet” is an understatement, and everyone–the “dry people” that is–just looked at me with pity, entertainment and, in some cases, surprise, that I was still there and not under the roof. (You cannot see the window from under the side arches of the piazza). Well…although in hindsight I know everything was worth it, at the moment it seemed like a terrible idea that I had gone to the Vatican at all. A good twenty minutes into my weather odyssey, a mother and his son (who was about my age and wore a Yankees hat) signed me to come and share their mid-size umbrella with them. I don’t speak Italian, they didn’t speak English, but they still found a place for me to protect from the rain. It turns out that they were visiting Rome, and were originally from Calabria. We could barely understand one another, but they were so kind I just couldn’t wrap my mind around the fact that they would host a complete stranger, soaking wet, under their umbrella. Moreover, all the time they were smiling, gently. I have their faces fixed into my mind. When the Angelus ended with the benediction from the Pope, I thanked them and returned to the train station to catch the train back to campus. As I seated, wet, in the station, all I could think about was these to kind calabresi. After getting back from Paris, all I could really think about was my boyfriend coming to visit in just 2 days! Tuesday finally arrives and he arrived in Rome safe and sound 🙂 After Brian arrived I showed him around JFRC and ventured to the city. Because he only had 4 days in Rome, we ran around the city as I tried to show him everything I could before we had to meet my class at the theater. 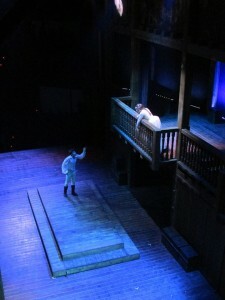 My Italian professor thought it would be cool if we saw Shakespeare’s Romeo & Juliet in Italian at a theater that was modeled after the Shakespeare Globe Theater. Now, I know very little Italian, but it was so beautiful and really amazing to see the performance even in a foreign language. Over the next couple of days Brian and I did A LOT of sight seeing! 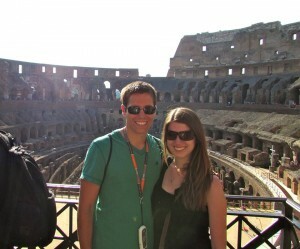 The Vatican, St. Peter’s, the Colosseum, the Roman Ruins and much much more. But, I managed to take him to everything that I had seen over the past 4 weeks in 4 days! I had a blast showing him around Rome and being able to experience everything with him 🙂 Sadly, those last 4 days flew by and before we knew it we were getting ready for the farewell dinner. 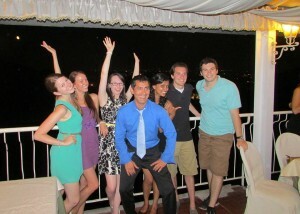 The farewell dinner was at a beautiful restaurant in Balduina called The View, and it definitely lived up to its name! The whole restaurant looked over the city and the food was fantastic! Having dinner as a campus one last time was so much fun. Eating, drinking wine and talking about the past month was the perfect end to the perfect trip. 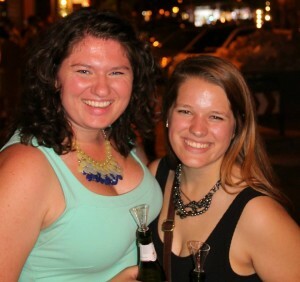 I had the time of my life in Italy! I met some amazing people that I never would have met (even though we went to the same school) and I went on so many adventures and created countless memories. Studying abroad was one of the best decisions I ever made, because it gave me a chance to see the world and the different cultures within it and experience it with new friends. It was my first time going to Rome, but not my last. I was so sad to leave Rome, but extremely excited for what was ahead. Brian and I were traveling to London in the morning and I couldn’t wait. I said good bye to all of my new friends and my home for the past 4 weeks and off to London we went! Arrivederci Roma! I’ll be back!! The “six pack” at The View of the farewell dinner… and Professore Martinez haha.